(Swiss Chard) Swiss chard is the succulent leafy green tops and whitish stems of a beet plant; however, the leaves of the Swiss chard are much larger than those of the common beet. 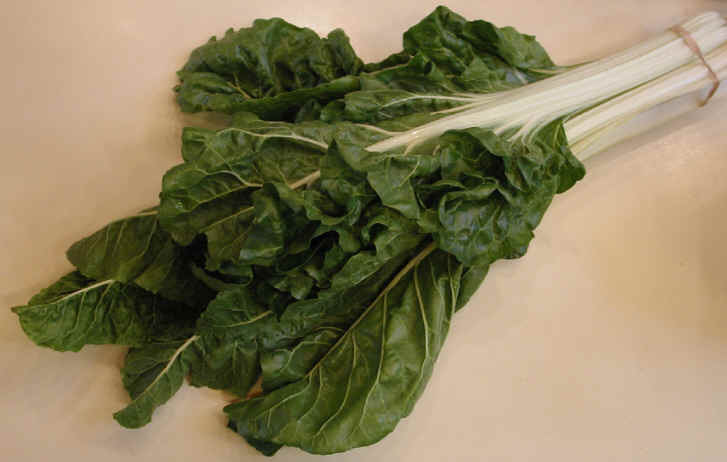 The name, Swiss chard, is often shortened to "chard" and is sometimes called "leaf beet" or "sea-kale beet." Select Swiss chard that is fresh (not wilting) and free of blemishes. There is also a red leaf and stem variety, and recently, we have seen a yellow stem variety. Swiss chard tastes somewhat like spinach. The bunch of Swiss chard in this photo was about 2-1/2 feet (3/4 meter) tall. 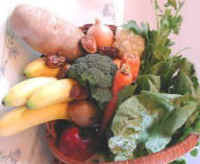 See the nutritional charts below for raw and cooked Swiss chard.